Communion is a vision of a world where all nations and cultures will stand together, no hatred simply because of colour, religion or culture, but an understanding and tolerance of their differences. let’s hope the New Year 2016 is Happy and Healthy for you all, I will be busy in the studio for my upcoming exhibitions the minute the turkey is finished! Golly, we are hurtling towards the end of November and that means just one thing… the Knitting and Stitching show is moving on to Harrogate ….. I just love this show, they are all subtly different and this is one of my favourites… Here I am working on the Artist in Action stand in 2010 for Art Van Go.. Note the change of hair! I will be back there this year on the Artist in Action stand for Art Van Go on Friday Sat and Sun morning, so please pop over and say Hi if you are going to be there. Friday morning will see a double act with Kim Thittichai and I working on the same bench… we have a two man show coming up at the ICHF show at the NEC, B’Ham in March 2016, so this will be our first get together to start some planning and get some work done. Then I will work solo for the rest of Friday, all day Saturday and Sunday morning. 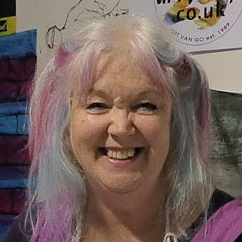 I will be working with procion dye … some drawing, some monoprinting, and anything else that comes to mind while I am working … I plan to decorate my washing line around the whole of my area!